From his parents, Weinberg inherited his penchant for hard work. But his artistic ambition was just an accident, he believes, or perhaps the result of one. "It may all come down to the fact that I hurt my eye when I was about four," he theorizes. The eye was saved but his vision was permanently impaired. He was left with distorted depth perception, able to see only impressions out of his right eye. Throughout his childhood, there was great concern about his ability to see. Still, from the day he picked up a crayon, he showed promise. "Copying Mickey Mouse and Donald Duck on shirt cardboards - that was my specialty. My father had his shirts laundered, and they all came back on shirt cardboards. That was my favorite medium." He traces the birth of his predilection for sculpture to his three-dimensional projects. He was always building soapbox derby racers, burglar alarms, submarines. But it was his youthful passion to create that won his parents over. When he was 14, he made a small clay relief and accidentally broke it while trying to cast it in plaster. It made him cry desperately, his mother recalls. If it's that important to him, she decided, he ought to have lessons. So she called Henry Kreis, a German sculptor living in Essex, Connecticut. Kreis was teaching at the Hartford Art School then housed in the Wadsworth Atheneum, and he suggested that young El enroll. So he lied about his age and studied there at night throughout high school. 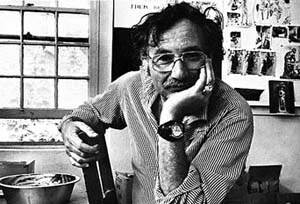 It was a rigorous schedule, but he surmounted it to become valedictorian of his class at Weaver High in 1946... After graduating, Weinberg enrolled at the art school full time and continued to study with Kreis, whom he idolized and to whom he credits his preference for lyrical, figurative work. He was equally devoted to Waldemar Raemisch, another German, with whom be studied upon transferring to the Rhode Island School of Design after two years. "He couldn't express himself in English," Weinberg says. "He was just a tremendously inspirational person-- his work and his love of art." Under Raemisch he studied hard, but it was a labor of love. "When I was in art school, I had my own studio and boy, I worked." ...He worked at a car wash, painted flowers on furniture, taught arts and crafts at a boys' club. Meanwhile, he slaved away in his studio, an abandoned bathroom at the Volunteers of America, the home for derelicts in which he lived his first year. "I paid $2 a week, and I lived on crackers and jelly given by the Colonel, who ran the place. I lived with all the down-and-out guys, and the Colonel -- I'll never forget him -- he kept us alive." Ultimately, all this diligence and deprivation paid off. After graduating at 23, Weinberg became the youngest recipient to ever have won the Prix de Rome, entitling him to two years of study in Italy. There, he met poets, painters, and musicians, and discovered that, for an artist, Europe is not just an ocean away but a world apart. "You get up in the morning and you go out and greet your friends. In America, they say, 'How's business? How much did you make this month?' Whereas in Europe they ask you what you're making or what you're doing. They don't ask you how much you sold this year. Art is business here, and that's not what it's all about." Upon returning home, he underwent not only cultural jet lag but future shock. He had accepted a scholarship at Yale School of Design, which involved assisting the master sculptor, José de Rivera, an abstract purist whose work was based on precise, mathematical concepts. The head of the school was Josef Albers, the famed German-born abstractionist best known for his series of paintings "Homage to the Square." It was Albers who had summoned Weinberg from Rome. "Come back and teach the figure," he had written. "Even though I don't believe in the figure, I think it should be taught in my school." Weinberg complied, only to be stylistically ostracized and denounced by the dictatorial Albers in front of his students. "The prevailing mode in the sculpture department was a certain kind of pure abstraction. I did not fit in. And I could not adapt. It wasn't my way." But try he did, for three years. He felt it was an inevitable confrontation. "It was like 'How to Live with the 20th Century' -- a decompression chamber. How to co-exist. How to learn to take from it without letting it upset me..."
While living in Rome, he had been given his first commission by a visiting couple from his hometown, Marcus and Bluma Bassevich. Weinberg had it on display in his living room at Yale, where it was spied by a visiting trustee of the Museum of Modern Art. "Ritual Figure", a woodcarving of a man blowing a shofar, was an unusual piece, but not for Weinberg; it had two arms growing out of one shoulder. "When they said they'd buy it, I remember rushing through the streets into my friend's house, running up to a girl I knew and saying, "I've got to kiss someone." And she was offended. "You mean, just anyone? It doesn't matter who it is?" "Ritual Figure" made the cover of Art in America. Soon after, Weinberg got a knock on his door..."I hear you sold something to the Museum of Modern Art. I'm interested in you. 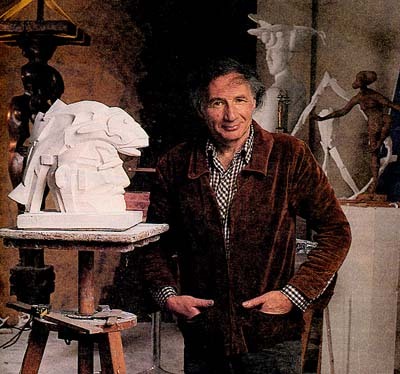 "I just thought he was a great sculptor," said Grace Borgenicht [of the Borgenicht Gallery in New York City.] "I go by my eye and I guess it's pretty good, because I've stayed in business for 37 years." So Joe gave me the money to give him to buy the wood, and then he did a beautiful woodcarving which they bought and put in the museum." 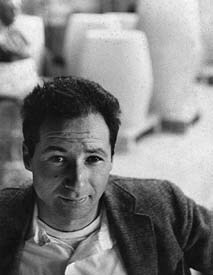 In 1959 Weinberg landed a Guggenheim Fellowship, a grant for a year of work. He decided to return to Rome for the year and ended up staying for 11. "It was a paradise for sculptors. They love artists. Whether you're good or not, they call you Maestro. 'Buon giorno, Maestro!' It's a wonderful feeling..."
Returning to America, he taught at Dartmouth and Boston University as visiting Professor of Sculpture, then back in Rome at Temple University, at Union College in New York, and finally, starting in 1983, as Professor of Sculpture at Boston University. Among the major public commissions Weinberg completed during this time were: Procession for the Jewish Museum in New York, Jacob Wrestling with the Angel for Brandeis University, Justice for the Boston University School of Law, and the Holocaust Memorial for Freedom Plaza in Wilmington, Delaware. "Elbert has a unique way of giving life to form, where the piece carries with it an aura that's very special," Portman said. He's a very warm person, and I think it comes out in his sculpture." Weinberg's exuberant Joie de Danse not only illustrates his skill in gearing a piece to complement a specific environment, Portman believes. It is also an exceptional, compelling work. "It just grabs you.' he says. "Just to observe people looking at it and see the response on their faces tells the whole thing ... He's one of the best." Weinberg's early subjects draw heavily on mythological and Biblical themes, but there are also more contemporary, earthbound motifs, such as his mad dog series. "...People might say, 'Oh my God, what a thing to try to do in sculpture!'" notes Weinberg. 'An idea like that.'" He is the first to acknowledge that these fierce beasts are unsettling, but bristles at a suggestion that they may not be what people want in their living rooms: "This is not art for all," he thunders. "What does this have to do with the average person? Most people don't understand art," he declares, "any more than they understand Greek. "Art is a language, like any other language. You have to be exposed to it, you have to learn it. The average person, without that training, likes things that look like reality." He poses one hand before him. "If you saw my hand in wood or stone, the average person would say 'fantastic!' And it would be a piece of trash!" As a figurative sculptor, Weinberg doesn't reject reality, but often departs from it radically to offer his own interpretation. Weinberg used to work on one piece at a time. First, he would make a series of drawings. Then, on one special day, when he was feeling at his best, he would sit down and fashion a model. Once satisfied, he would spend nine months making the piece--carving it in wood or casting it in bronze. Then he would start another. "Now I'm working on 20 pieces at the same time," he says. "And I'm enjoying working more than I ever have in my life." After years of exercising his imagination, he has honed his mental muscles into tiptop shape. Even the craft part comes easier now. "There's something about having done it for so many years that you get familiar with the process. It's more like talking. It's part of you...I feel anything I conceive, I can make," he says. "I am whistling and hopping here in the studio now. I mean, it can be painful when a thing doesn't come out right. But I'm getting kicks all the time." --Adapted from article in The Hartford Courant Northeast Magazine, March 20, 1988, by Patricia Weiss. Elbert Weinberg died in December of 1991 of myelofibrosis, a rare disease of the bone marrow that was diagnosed ten years earlier. 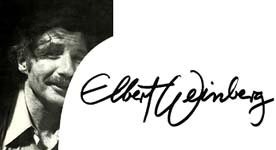 The Elbert Weinberg Trust has been established to preserve his work and to ensure that the work of this sculptor of genius continues to receive the recognition it deserves. All works shown here, except public commissions, are for sale. Each is marked as limited edition, open edition, or one-of-a-kind original.